The Kendrick House Inn is a historic boarding house with 5 guest rooms. One room or suites of 2-3 rooms with private bathrooms are available. The B&B can be rented exclusively at a reduced rate per night. Rates start at $99.00 for single/double occupancy and are subject to change. 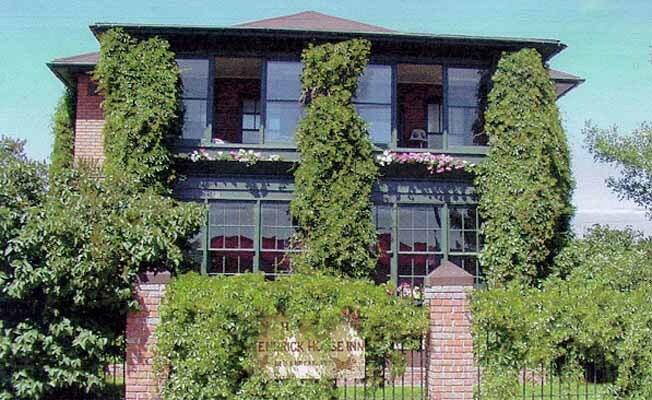 The Inn was built in the Edwardian period (1915) and decorated in vintage English/French style with all rooms having a pedestal sink, antique bed-framed beds, and period dressers, as well as several yesteryear memorabilia collections of crazy quilts, half-doll pincushions, vintage teacups, and vintage books. Bathrooms are equipped with claw-foot tubs, showers, pedestal sinks and pull-chain toilets. Guest areas include a library with television and a parlor/living room and porches. In the formal dining room, and true to the boarding house style, a large Montana breakfast is served with other guests. Enjoy the evenings in the large fenced-in flower garden in conversation or reading. The Kendrick House Inn is ideally located for those guests who want to visit the Little Bighorn Battlefield and Yellowtail Dam recreation area. The Inn is also located one block from the main business area of Hardin, giving easy access to local restaurants, movie theaters, library, art studio, and shopping.